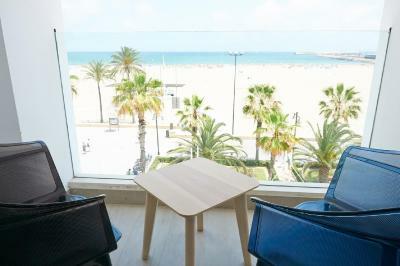 Lock in a great price for Hotel Gabbeach – rated 8.4 by recent guests! Wonderful location - very friendly personnel - food at the restaurant was (surprisingly!) good. The view from the restaurant over the beach is very nice - definitely at breakfast. Also an important + point for Valencia: the hotel is located next to a Bike location post (Valenbisi). Grab a bike and 10-15 minutes later you're in the City of Arts and Sciences :). Awesome location for the beach. We did the city bike rental and used that to get around town mostly (city is super bike friendly). Awesome modern hotel, jetted hot tub with our beach view. Good A/C and decent sized room. Restaurant downstairs had a good breakfast and good food overall. Decent bar as well. The room was fantastic! We really loved the hot tub with the sea view. Hardly wanted to leave the hotel! We had a welcome cocktail and ate lunch and dinner here. The food was delicious! Nice and clean rooms. Good and friendly staff. Cool Design and fancy illunination. The lady at the reception was lovely and tried her best to help. The hotel is just in front of the beach and near the tram. The staff is nice. Hotel Gabbeach This rating is a reflection of how the property compares to the industry standard when it comes to price, facilities and services available. It's based on a self-evaluation by the property. Use this rating to help choose your stay! This stylish, design hotel is located next to Valencia's Las Arenas Beach. 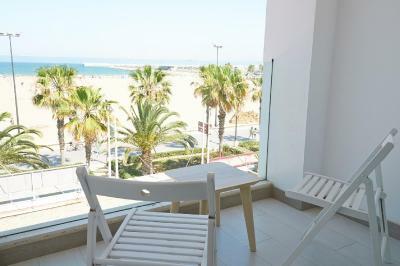 It offers a restaurant and a cocktail bar, and is just one minute's walk from Valencia Harbor. The themed rooms at Hotel Gabbana Beach feature unique, contemporary decor. All have a TV and bathroom. 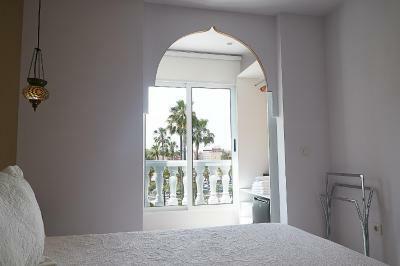 Some offer a terrace, sea or garden views and spa bath or shower. All have free fast broadband internet connection via WiFi and cable. Breakfast is served daily and the Gabanna restaurant offers a fusion of modern international and Spanish cuisine. The hotel also has a pub which closes at 03:00. The property offers banquet facilities and meeting rooms. There are a number of bars, restaurants and shops on the same street as the Gabbana Beach. Buses to the center pass from a stop opposite the hotel, and the Ciutat de les Arts i les Ciències is 1.9 mi away. Ferries to Mallorca, Menorca and Ibiza all leave from the port. The Gabbana Beach is 1,000 feet from the Neptú Tram Stop and Metro Station. When would you like to stay at Hotel Gabbeach? These air-conditioned rooms face a bright interior courtyard and are decorated in different styles. They include free WiFi, a flat-screen TV and a private bathroom with hairdryer. 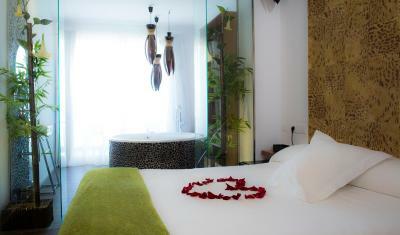 These air-conditioned rooms face a bright interior courtyard an dare decorated in different styles. They feature a spacious hydromassage shower with color therapy lighting. They include free WiFi, a safe, flat-screen TV and a bathroom with a hairdryer. 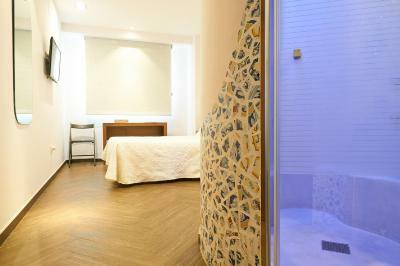 These air-conditioned, double rooms feature a unique décor and offer garden views and a hydromassage spa bath. 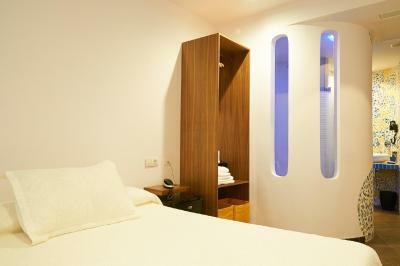 It includes free Wi-Fi, a safe, flat-screen TV and private bathroom with hairdryer. Some rooms also offer a terrace. 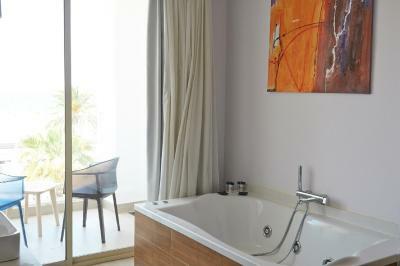 These air- conditioned suite rooms feature different styles and a terrace with sea views. They include free WiFi, a TV, and a private bathroom with hydromassage bath, shower and a hairdryer. House Rules Hotel Gabbeach takes special requests – add in the next step! Hotel Gabbeach accepts these cards and reserves the right to temporarily hold an amount prior to arrival. Every guest must provide a valid ID at the check-in desk. Guests under 18 years of age should provide authorization from a legal guardian. Please note that when booking 3 or more rooms, different conditions may apply. Please note that spa baths can only be used between the hours of 10:00 and 00:00. You could see that the facilities of the hotel have it's age already. Location was great, just right on the beach, next to the beautiful harbour. The breakfast was so-so, instead of the fresh orange juice (in Spain(!)) we've got the bottled juice. Otherwise, stuff is very helpful and kind. Very bad case of Food poisoning left me ill for days. Staff unhelpful and only interested in denial. Would recommend to anyone I hated very much. Very shiny on the outside but not so, on the inside. I have never written a bad review anywhere before so that says how bad it is. Breakfast good, but very poor. No buffet. Breakfast never the money worth, better book without breakfast and eat somewhere else! American breakfast was terrible. First day breakfast Room Was freezing we all had to sit with coats on. Lastly I was very disappointed that we had stipulated it was our 25 wedding anniversary and nothing was offered as a courtesy gift. We have always received something on anniversary trips whether a cheap bottle of cava, room upgrade or just an extra personalised touch but your hotel just wanted money I fact an extra 40 euros and I feel as though we had already paid over the top for the condition of the room. Jacuzzi was more like a bathtub. Manual on how the jacuzzi works would've been helpful. Bathrobes weren't provided by the hotel. LOVE the breakfast selection and the terrace view. The room is warm and clean. breakfast wasn't available until 8.30am! My room was close to the kitchen. It was noisy and occasionally I would smell strange cooking fumes. Parking was not easy but we found one down the road.